Hai Duong (VNA) – Deputy Minister of Natural Resources and Environment Vo Tuan Nhan on April 8 asked the northern province of Hai Duong to reduce the practice of burying of waste and called for more investors to building waste treatment plants using advanced technology. During a working session with provincial leaders, the official also noted that 70 percent of waste have been buried, which is expected to be decreased to 30 percent in 2025 following a planning approved by the Prime Minister. Nhan asked Hai Duong to design support policies to attract investors, while strengthening communications to raise public awareness of reducing the use of plastic bags and sorting waste. According to the People’s Committee of Hai Duong, the province releases about 900 tonnes of household solid waste each day, of which 307 tonnes are from urban areas and the rest from rural areas where only 75.5 percent of waste were collected in 2017. 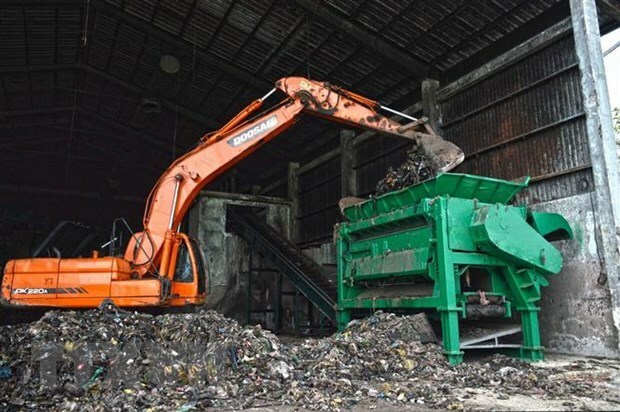 Hai Duong has approved a planning of six concentrated waste treatment areas, along with 55 hectares of planned waste burying fields in 2020. Currenly, 42 collection teams, seven cooperatives and four companies are engaging in gathering garbage in urban areas and 1,152 other teams in rural areas. Nguyen Anh Cuong, Vice Chairman of the People’s Committee of Hai Duong, said that household solid waste in urban areas are treated by burning and burying, while most of the wastes in rural area are buried. However, agricultural wastes such as pesticide containers have yet to be properly collected, he said.